Good norming! I wanted to show you some pictures from my visit to Prairie Queens on Saturday! I had a great time hanging out there, they had a lovely reception with delicious holiday treats and the most wonderful punch. I appreciate their support!!! If you're looking for Pam Kitty Picnic in my neck of the woods Prairie Queens has all of it! 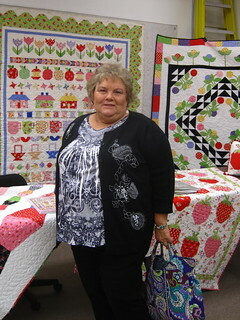 April made this wonderful quilt using Pam Kitty fabrics from past collections. It's adorable, right? You can get starter kits at the shop. I brought a few of my things, and they had a lot of really great samples.. so inspiring! Look at this cute runner Keiko made with blocks for Lori's book! So cute. Those apples are a favorite of mine! There were a lot of blog readers who stopped by, and new friends to met. I so appreciated everyone making the trip to come say hi. I was happy not to be sitting in the classroom alone! Thanks for the cute Susan Branch calendar Martha! It was great to see you and have a chat! 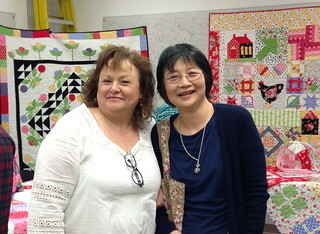 I had a wonderful time, thanks Prairie Queens for having me! Oh I so hope your dog is ok. We're on the same watch. Not good. Love your site & read it daily! Happy Holidays. Look at all that beautiful fabric!! 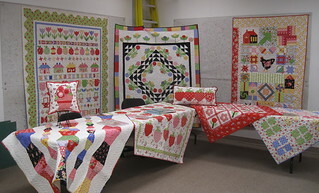 All the quilts are so pretty!! What a fun time. Sorry about your dog, hope he feels better soon!! Oh No! Sending good wishes to Rocket -- I hope he gets better soon! Sending up a prayer for Rocket in hopes that he will feel better soon. Thanks so much for the pictures and giving us such prettiness to brighten up our day! All of your fabrics are beautiful and have the best saturation of colors!!!!!!!!!!!!!!!! I. have swooned over that appliqué floral quilt since I saw it on Pinterest! 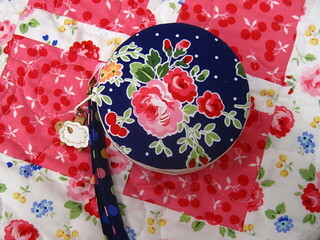 Do you know the name of the pattern? 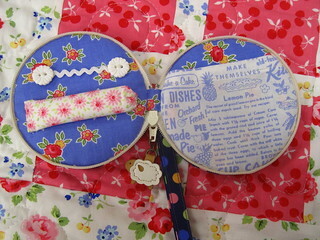 Loved seeing all these gorgeous fabrics and pretty makes! Sending good wishes for poor Rocket to get well soon. Oh, how I wish I could have gone!!!! Give Rocket a great big hug from Maggie, Mollie and myself! 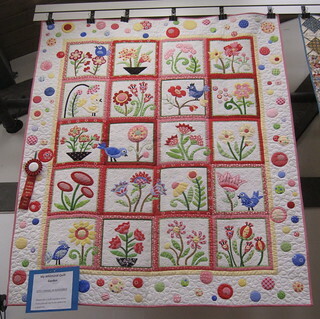 The floral and bird applique quilt is a pattern by Becky Goldsmith & Linda Jenkins - My Whimsical Quilt Garden (C & T Publishing). I, too, love it in Pam Kitty fabrics! Looks like a fun time! I'm sorry your faithful Rocket isn't feeling well. I hope he is better this evening. It was great to meet you Pam! I hope Rocket is feeling better from all of your TLC. Big hugs for Rocket, been there with our sweet boy Spike. They just tug your heart. I hope that your dog gets well soon. It's so hard to see them sick. I absolutely love Pamkitty picnic. Because I am on an austerity kick right now, I cannot allow myself to buy any fabric until the first of the year so hope there will still be plenty of it left when I can again spend. I have so many plans for it. 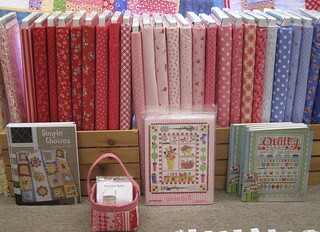 Is there a pattern for that first quilt or does it just come in kits? 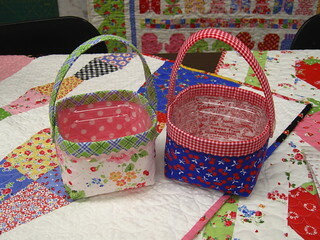 I would love to make it, but I like to pick my own fabrics for the quilts I make. Just received ALL my Pam Kitty Picnic. OMG I love it all. The navy is purrfect! Hope Rocket gets better soon. Best wishes for your little friend! And have a wonderful Christmas, too! 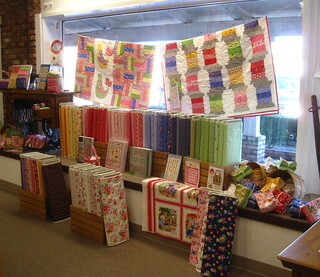 Looks like a fabulous quilt shop! Everything is so pretty. Hope your doggie is better. A very Merry Christmas to you! Aw what a great time. Love the pictures. But bitter sweet because of Rocket. Many tears.